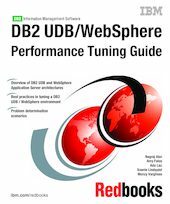 This IBM Redbooks publication deals with tuning a DB2 UDB / WebSphere Application Server environment, and is aimed at a target audience of DB2 UDB application developers and database administrators (DBAs). We provide an overview of WebSphere Application Server architecture and its main components, and introduce some of its key application tuning and system tuning parameters. Then we continue with an overview of DB2 UDB architecture and components, and introduce its key application and system tuning parameters. We describe in detail the key components that impact performance in a WebSphere and DB2 UDB environment, and provide best practices guidelines for tuning such an environment. Finally, we discuss some of the commonly encountered problems in a DB2 UDB / WebSphere environment, and describe scenarios for identifying and resolving such problems.